Quick four ingredient recipes. quick Indian four ingredietnt recipes. There are many reasons why some people find cooking stressful – and it is our goal to find and root out each of these problems so that cooking becomes a pleasure for everybody. While some people avoid cooking because it takes time, some people find just ‘stocking up’ to be a hassle. Sourcing and maintaining innumerable Indian ingredients, without them rotting or spoiling can be a headache. Moreover, some veg ingredients are so exotic that they can be used only in a few specific recipes. Some veg Indian recipes are so elaborate that just assembling all the ingredients together and preparing them takes more than half an hour. Well, often it is worth the effort – because the dishes do turn out as grand as the ingredients that go in – but on a busy day, nobody has time for such fare. We gave this some thought, and you can see the results in this article. 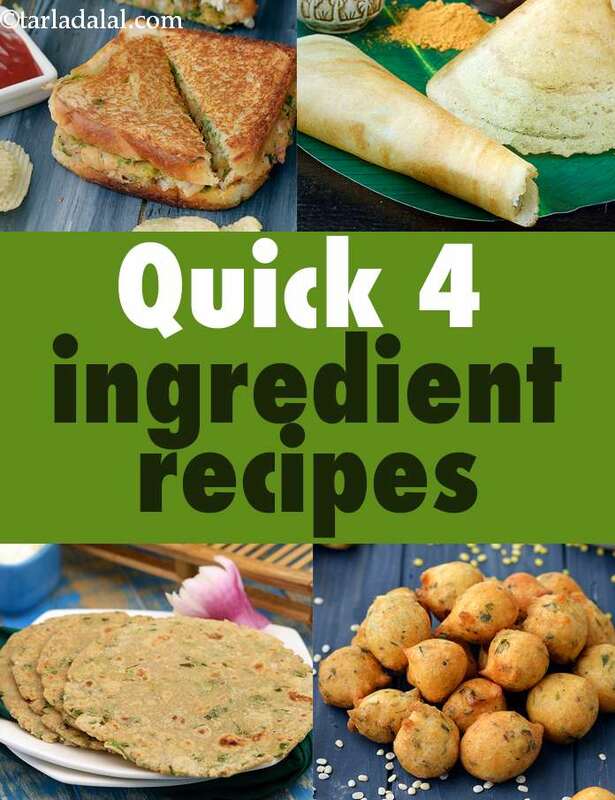 This article on Quick Four Ingredients Veg Indian Recipes brings to you an assortment of recipes, each of which needs just four major ingredients. Most of these 4 ingredients veg recipes are common ones that you will have at your Indian kitchen. Take the dosa, for instance. All you need is rice and urad, both of which are usually there at home. Plus, even if you buy the ingredients, they won’t go waste because you can make loads of recipes using these. A similar logic applies to the Hariyali Chawal. The recipe focuses on the awesome flavor of coriander, which gives the rice an instant perk-up. If you take a closer look, you will find that many of these recipes highlight the special characteristics of one or two ingredients, such as coriander, garlic, banana, mooli or vanilla, which have the power to make the dish special. These ingredients have such a strong flavor and aroma that they can enhance a dish without much help from other ingredients! If you understand this concept, you can easily create many more such stunning recipes with a small array of ingredients. The recipes span different meals, right from quick breakfast, quick roits, quick subzis to quick dals and quick rice, and even quick snacks and quick Indian desserts. Take your pick from Paneer Paratha, Oats Upma these, and enjoy the comfort of a home-cooked and tasty meal even on hurried days. You will also discover many more such easy but awesome recipes with minimal, common ingredients on our website and app. Remember, it is not all about what goes into a dish; it is also about how the ingredients are used – so take a few ideas from this to cook smart, live smart. Enjoy our quick four ingredient recipes. quick Indian four ingredietnt recipes and other quick recipe articles below.